The man on the left is someone disguised as my incredible husband. 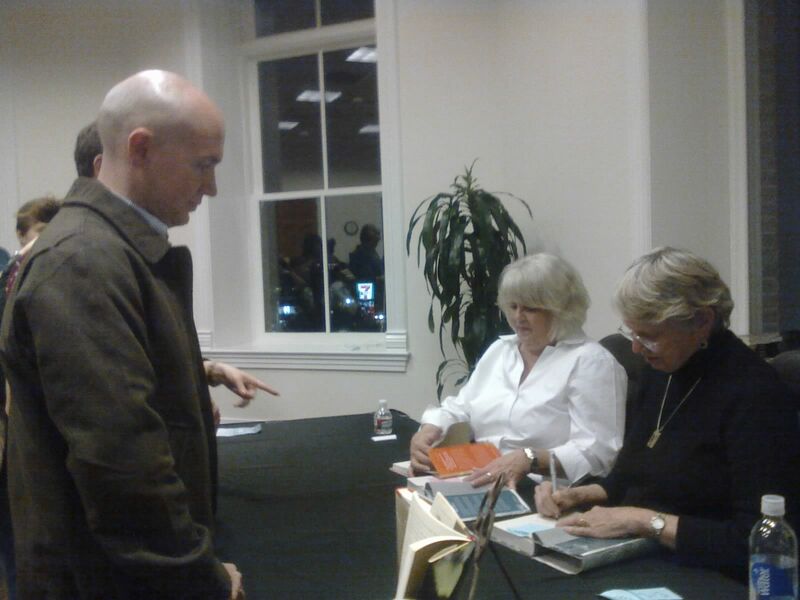 The woman in black on the right is the real Lois Lowry. She came to the Provo Library tonight on a book tour. She’s promoting her latest book, Son, the “thrilling conclusion to the Giver” series. She had some interesting things to say about her stories, her writing, her life. She made us laugh, and she also made us wait in line to get her autograph. 1. Do you have any regrets about how late you started your career? 2. How did Gabe get down the hill on the sled? Where did the sled come from? 3. Who’s your favorite character ever? 4. Do you consider the Giver an allegory? 5. How did you decide to leave color out of the Giver? 6. Some question I’ve completely forgotten. The director of the Provo Library reminded us that Lois Lowry is one of five authors to win the Newbery Award twice. Pretty dang cool. The man disguised as my husband got a copy of Son autographed for the junior high school where he works. I wonder how many kids there will even read it. A society where no one reads is the worst dystopia of all. So it seems that my husband was disguised as himself. No one knew who he was. The cleverest ruse. I enjoyed listening to Lois Lowry and meeting her and thanking her quickly but sincerely for her autograph. Her authorgraph. Thanks so much for coming to Provo!